Katherine Young creates acoustic and electro-acoustic music that uses curious timbres, expressive noises, and kinetic structures to explore suspended time, genre fiction, the communication of ensemble energies, and the tension between the familiar and the strange. Anthony Tommasini in The New York Times described Katherine’s Inside UFO 53-32, as performed by the Flux Quartet, as a “raw, wailing, coloristic piece” with an “organic sweep.” Recent projects include composing for dance, a new work for TimeTable percussion with Issue Project Room’s Emerging Artists Commission, and a commission for the String Orchestra of Brooklyn. As a bassoonist, Katherine works as an improviser and chamber musician, soloist and bandleader. 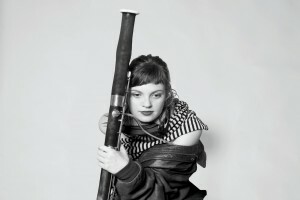 She has documented her work on numerous recordings, including a 2009 solo release, which garnered praise in The Wire (“Bassoon colossus”) and Downbeat (“seriously bold leaps for the bassoon”). Current projects also include: Architeuthis Walks on Land, Pretty Monsters, the Fancy, and Till by Turning.